Forklifts should only be driven at speeds below five miles per hour. Only certified forklift operators should drive the forklift. Only trained personnel should work on any type of mechanical equipment. Inspect the forklift before every shift. Insistent on this practice like an airline pilot checking the plane before boarding. Make it easy for employees to do the checks by providing a check-list of items that need to be inspected or noted to make sure everything is in working order. Have employees make it a habit to complete or review the checklist every time. Keep forklifts and any other machinery dirt-free, especially the wheels, to help to maintain the cleanliness of your entire warehouse. Prohibit cell phone use while driving the forklift. This seems like this should simply be common sense, but it’s amazing how many infractions occur and how many accidents result from cell phone use while driving heavy equipment. Discourage distractions of any type – music, personal conversations, etc. A safe employee is an alert employee. Workers need to have all of their senses available to avoid accidents. Multi-tasking and operating heavy equipment is a hazard waiting to happen. Keep loads low. 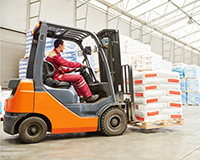 Loads on the forklift should be placed on the forklift in the completely down position and remain low while the forklift is moving. Only elevate the load when you’ve reached your destination. Check around the forklift on all sides before moving it in any direction. Make sure there are no people in your pathway and that you have plenty of clearance around any objects in your path. In fact, having someone else check out the path prior to moving and reporting an “a-okay” is very helpful. Use only the designated tracks in the warehouse for the forklift. Deviating from the track not only inhibits effective use of time, it also endangers those who might be in its path unexpectedly. Avoid wet or sticky areas on the floor. These can cause you lose traction and control of the vehicle. The tires will also carry that mess into other areas of the warehouse, causing additional safety issues. Know the capacity of your forklift and make sure all workers know it, too. Don’t move loads that are heavier than capacity – not even a few pounds. Doing so can cause products to fall, shift or break or cause an imbalance of the forklift itself. All of these are dangers to the forklift driver and other employees. Wear safety gear. Hard hats, safety goggles, steel-toed shoes and brightly colored safety vests are all necessary items for safety – not only for forklift operators, but also for warehouse workers in general. Remember: “Dress for success.” This is one place you can’t afford to fail. Eliminate distractions and any horseplay around forklifts and other heavy equipment. Despite the fact that employees should always behave professionally and make safety the number one priority, sometimes someone jokes around or engages in physical horseplay. Institute a zero-tolerance policy and consistently deliver the consequences in the event of a mishap. Safety is non-negotiable. Take advantage of the materials offered by safety groups and OSHA. Posters, signs, games and booklets are available. Don’t just order them. Use them. Have regular safety meetings for employees. Keep repeating safety tips and make sure everyone is trained on the equipment and aware of both the rules and the consequences for breaking them.